You can use the “Front-end Booking Catalog” view when you want to show your service in a form of a catalog. To add the “Front-end Booking Catalog” view on one of your pages, click “Pages” the in the WordPress admin panel, and then click on “Add New”. You will see the “Amelia” insert shortcode button. Show catalog of all categories. Put the shortcode on the page and “Publish” it. Besides these three main Catalog shortcodes you have the option to set more advanced booking parameters. To do that, click on the “Preselect Booking Parameters” option, and two new options will show: “Select Employee” and “Select Location”. With these two options, you can show the catalog of services for just one specific employee or one specific location, or you can combine them with the main shortcodes to show whatever you need. In the “Front-end Booking Catalog” view, categories are shown in a form of cards with their name, the number of services that belong to that category, and the services picture. 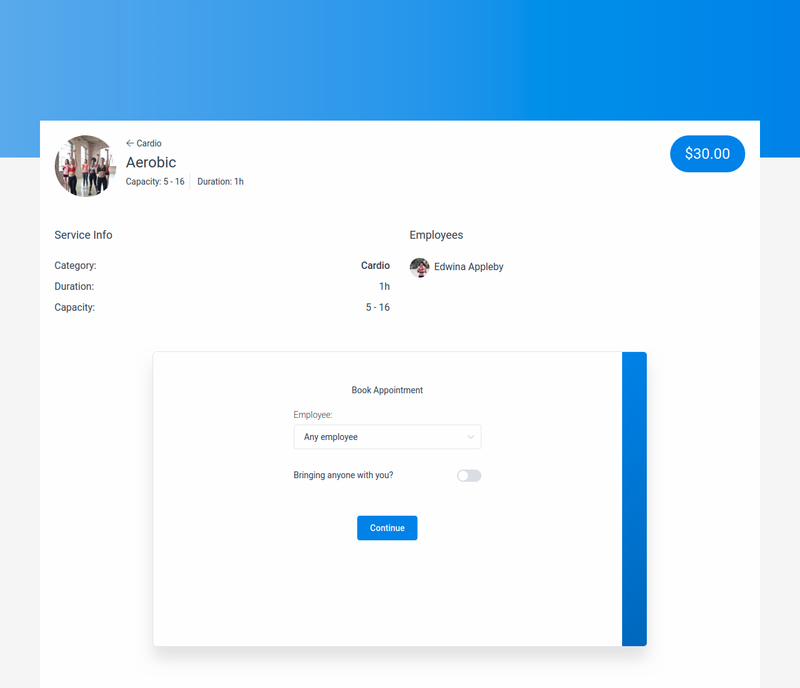 After your customer chooses a category (which you can also show separately by choosing the second shortcode we mentioned above), he will see similar boxes for services with service picture, service name and price, and pictures of employees that are assigned to it. The customer is than able to choose between the services and open the one he wants to book, to find out more about it (that is the third option mentioned above). Opened service provides lots of information: capacity, duration, description, a category that service belongs to, assigned employees and extras information (if service has any extras configured), if the customer chooses to book it he can easily continue in the same page in the wizard below. The only difference between this wizard and the one you get when you insert the “Step-By-Step Booking Wizard” view is that here you’ve already chosen the service so you only need to choose the employee in the first step.